An extremely fashionably designed and ahead of its time antique 1900s late Victorian era turn of the century sapphire and diamonds ring. Such a geometrically arranged bow tie ribbon design is rarely seen and would without doubt make any lady's hand stand out and call for an admiration. The two synthetic sapphires are deep sea blue in an yet another scarcely made bullet cut shape. Both measure 12mm (about 1/2") long and 5mm wide and are most certainly about 3.5-4 carats each. On each point of the bow tie and surrounding the two sapphires there are 4 smaller rose cut diamonds of about 2mm in diameter, while at the center of the ring there is a large 6x5.5mm Dutch rose cut off round diamond centerpiece. Total estimated diamond weight is about 0.70 carats. Gross weight of ring is 6.6 grams of 18K (18 karat) yellow gold, along with a thin platinum gemstone setting. ring size is 52 (UK size L/M; US size 6 1/4), but can be resized. 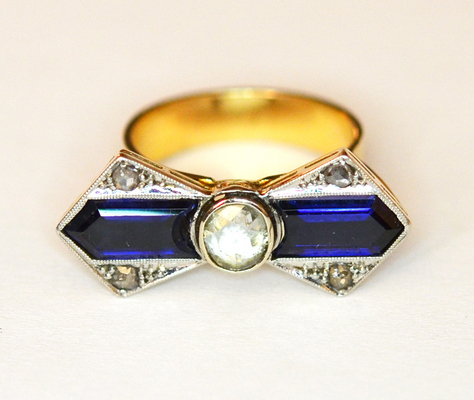 Outstandingly captivating antique jewelry fashion collector piece and one of the very nice Victorian sapphire and diamond rings and jewels.